Microsoft Excel Starter 2010 is a spreadsheet program designed for everyday tasks such as setting up a budget, maintaining an address list, or keeping track of a list of to-do items. Excel Starter is part of Microsoft Office Starter 2010, and comes pre-loaded on your computer. Excel Starter 2010 is very similar to Microsoft Excel 2010 in appearance. If you are new to the Ribbon interface or the Backstage view, Excel Starter gives you an opportunity to get accustomed to the new interface before upgrading to Excel 2010. Excel Starter differs from the complete version of Excel in that it includes display advertising, and it does not support the advanced features of the complete version of Excel. 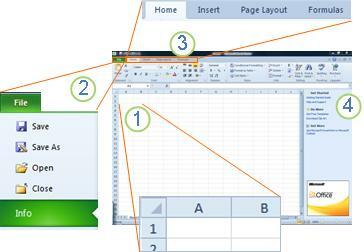 If you find that you want more features, you can upgrade to Excel 2010 right from Excel Starter 2010. Just click Purchase on the Home tab on the ribbon. Open Excel Starter with the Windows Start button. Click the Start button . If Excel Starter is not included among the list of programs you see, click All Programs, and then click Microsoft Office Starter. Click Microsoft Excel Starter 2010. The Excel Starter startup screen appears, and a blank spreadsheet is displayed. In Excel Starter, a spreadsheet is called a worksheet, and worksheets are stored in a file called a workbook. Workbooks can have one or more worksheets in them. 1. Columns (labeled with letters) and rows (labeled with numbers) make up the cells of your worksheet. 2. Clicking the File tab opens the Backstage view of your workbook, where you can open and save files, get information about the current workbook, and perform other tasks that do not have to do with the content of the workbook, such as printing it or sending a copy of it in e-mail. 3. Each tab in the ribbon displays commands that are grouped by task. You'll probably spend most of your time using the Home tab, when you're entering and formatting data. Use the Insert tab to add tables, charts, pictures, or other graphics to your worksheet. Use the Page Layout tab to adjust margins and layout, especially for printing. Use the Formulas tab to make calculations on the data in your worksheet. 4. The pane along the side of the Excel Starter window includes links to Help and shortcuts to templates and clip art, to give you a head-start on creating workbooks for specific tasks, such as managing a membership list or tracking expenses. The pane also displays advertising and a link to purchase a full-feature edition of Office. When you create a workbook in Microsoft Excel Starter 2010, you can start from scratch or you can start from a template, where some of the work is already done for you. 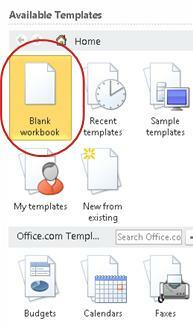 If you want to start with the equivalent of a blank grid, click Blank workbook. 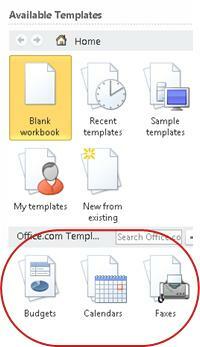 If you want a head-start on a particular kind of workbook, choose one of the templates available on Office.com. Choose from budgets, event planners, membership lists, and more. Excel Starter opens the blank workbook or template, ready for you to add your data. When you interrupt your work or quit, you must save your worksheet, or you will lose your work. When you save your worksheet, Excel Starter creates a file called a workbook, which is stored on your computer. If this workbook was already saved as a file, any changes you made are immediately saved in the workbook, and you can continue working. If this is a new workbook that you have not yet saved, type a name for it. To work with data on a worksheet, you first have to enter that data in the cells on the worksheet. Click a cell, and then type data in that cell. Tip To enter data on a new line in a cell, enter a line break by pressing ALT+ENTER. To enter a series of data, such as days, months, or progressive numbers, type the starting value in a cell, and then in the next cell type a value to establish a pattern. For example, if you want the series 1, 2, 3, 4, 5..., type 1 and 2 in the first two cells. Select the cells that contain the starting values, and then drag the fill handle across the range that you want to fill. Tip To fill in increasing order, drag down or to the right. To fill in decreasing order, drag up or to the left. You can format text and cells to make your worksheet look the way you want. To wrap text in a cell, select the cells that you want to format, and then on the Home tab, in the Alignment group, click Wrap Text. To adjust column width and row height to automatically fit the contents of a cell, select the columns or rows that you want to change, and then on the Home tab, in the Cells group, click Format. Under Cell Size, click AutoFit Column Width or AutoFit Row Height. Tip To quickly autofit all columns or rows in the worksheet, click the Select All button, and then double-click any boundary between two column or row headings. To change the font, select the cells that contain the data that you want to format, and then on the Home tab, in the Font group, click the format that you want. To apply number formatting, click the cell that contains the numbers that you want to format, and then on the Home tab, in the Number group, point to General, and then click the format that you want. For more help with entering and formatting data, see Quick start: Format numbers in a worksheet. You can use the Cut, Copy, and Paste commands to move or copy rows, columns, and cells. To copy, press CTRL+C to use the Copy command. To move, press CTRL+X to use the Cut command. Select the rows, columns, or cells you want to copy, move, or delete. To select a row or column, click the row or column heading. To select a cell, click the cell. To select a range of cells, click click and drag, or click and use the arrow keys while holding down the SHIFT key. Press CTRL+C to copy or CTRL+X to cut. If you want to delete a row or column, pressing DELETE while the row or columns is selected clears the contents, leaving an empty row or cell. To delete a row or column, right-click the row or column heading, and then click Delete Row or Delete Column. Note Excel displays an animated moving border around cells that have been cut or copied. To cancel a moving border, press ESC. Position the cursor where you want to copy or move the cells. To copy or move a row or column, click the row or column header that follows where you want to insert the row or column you copied or cut. To copy or move a cell, click the cell where you want to paste the cell you copied or cut. To copy or move a range of cells, click the upper-left cell of the paste area. Paste the data in the new location. For rows or columns, right-click the row or column heading at the new location, and then click the Insert command. For a cell or range of cells, press CTRL+V. The cells you copied or cut replace the cells at the new location. When you sort information in a worksheet, you can see data the way you want and find values quickly. Use the mouse or keyboard commands to select a range of data, such as A1:L5 (multiple rows and columns) or C1:C80 (a single column). The range can include titles that you created to identify columns or rows. To sort with just two mouse clicks, click Sort & Filter, and then click either of the Sort buttons. Click the top button to perform an ascending sort (A to Z or smallest number to largest). Click the bottom button to perform a descending sort (Z to A or largest number to smallest). By filtering information in a worksheet, you can find values quickly. You can filter on one or more columns of data. You control not only what you want to see, but also what you want to exclude. On the Home tab, in the Edit group, click Sort & Filter, and then click Filter. Note Depending on the type of data in the column, Excel Starter displays either Number Filters or Text Filters in the list. For more help with filtering, see Quick start: Filter data by using an AutoFilter. Formulas are equations that can perform calculations, return information, manipulate the contents of other cells, test conditions, and more. A formula always starts with an equal sign (=). Adds 5 to the product of 2 times 3. Uses the SQRT function to return the square root of the value in A1. Tests the cell A1 to determine if it contains a value greater than 0. In a cell, type an equal sign (=) to start the formula. Type a combination of numbers and operators; for example, 3+7. Use the mouse to select other cells (inserting an operator between them). For example, select B1 and then type a plus sign (+), select C1 and type +, and then select D1. Type a letter to choose from a list of worksheet functions. For example, typing "a" displays all available functions that start with the letter "a." To complete a formula that uses a combination of numbers, cell references, and operators, press ENTER. To complete a formula that uses a function, fill in the required information for the function and then press ENTER. For example, the ABS function requires one numeric value — this can be a number that you type, or a cell that you select that contains a number. A chart is a visual representation of your data. 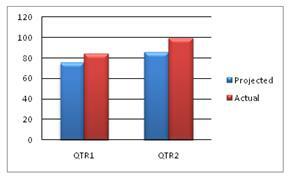 By using elements such as columns (in a column chart) or lines (in a line chart), a chart displays series of numeric data in a graphical format. The graphical format of a chart makes it easier to understand large quantities of data and the relationship between different series of data. A chart can also show the big picture so that you can analyze your data and look for important trends. 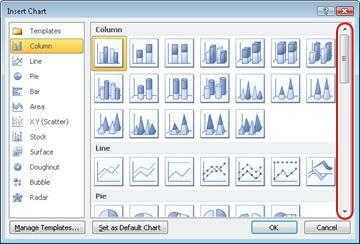 Select the data that you want to chart. Tip The data should be arranged in rows or columns, with row labels to the left and column labels above the data — Excel automatically determines the best way to plot the data in the chart. On the Insert tab, in the Charts group, click the chart type that you want to use, and then click a chart subtype. Tip To see all available chart types, click to launch the Insert Chart dialog box, and then click the arrows to scroll through the chart types. When you rest the mouse pointer over any chart type, a ScreenTip displays its name. For more information about any of the chart types, see Available chart types. Before you print a worksheet, it's a good idea to preview it to make sure that it looks the way you want. When you preview a worksheet in Excel, it opens in the Microsoft Office Backstage view. In this view, you can change the page setup and layout before you print. To print a portion of a worksheet, click the worksheet, and then select the range of data that you want to print. To print the entire worksheet, click the worksheet to activate it. Note The preview window displays black and white, regardless of whether your document includes color, unless you are using a printer that can print color. Sometimes you will want to share your workbook with others. If you are sharing the workbook with someone who also has Excel, you can send your workbook as an attachment to an e-mail message. 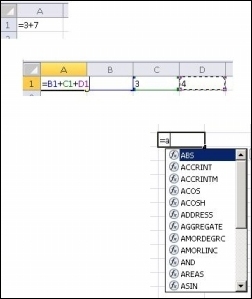 The recipient can open the workbook in Excel to work with it. Note Using commands for sending e-mail attachments requires that you have an e-mail program, such as Windows Mail, installed on your computer. If your goal is for the recipient to see the workbook, rather than edit it, you can send a snapshot of the workbook, as a PDF or XPS file. Click the File tab, and then click Save & Send. To send the workbook as an Excel file, click Send as Attachment. To send the workbook as a snapshot, click Send as PDF or Send as XPS. Your e-mail program starts an e-mail message for you, with the specified type of file attached. Write your e-mail, and then send it. An alternative to sending the workbook is to store it in Windows Live OneDrive. This way, you have a single copy of the workbook that is accessible to others. You can send people a link to the workbook, where they can view it, and even edit it in their Web browser (if you give them permission). Click Sign In, enter your Windows Live ID and password, and click OK. If you use Hotmail, Messenger, or Xbox Live, you already have a Windows Live ID. If you don't have one, click Sign up for a new account to create a new Windows Live ID. Select a folder in OneDrive and click Save As. Type a name for your file and click Save. The document is now saved on OneDrive. In OneDrive, you can give people permission to view and edit the contents of your folders. When you want to share a workbook, you send a link to it in e-mail. For more information about storing your documents in OneDrive, see Save a document to OneDrive from Office 2010. Office.com is continuously updated with new content, including how-to articles, videos, and training courses. If the bottom of the Help Viewer says Offline and you are connected to the Internet, click Offline, and then click Show content from Office.com.